Interview with Frank van Herwijnen owner of surf shop Cellblock in the Netherlands and also the European Distributor of HippyTree. Interview with Anthony Marcotti from Kandui Resort and Antidote Travel. The thing I like most about my job is that people love talking to me about their surf trips and day in and day out I get to send people on the best surf trips of their lives. Dead kooks is all about creating a one-off quality product tailored to the individual with a strong focus on functionality, form and a little flair. 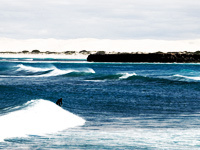 Eden Saul is the founder of Dead Kooks, read a little bit about what makes Eden tick. Matt Grainger has been working as a surf instructor since the age of 12. He went on to start up Manly Surf School and hasn't looked back. Interview with Carlos Sáez founder of Parafina, Kiteboarding Judge, Snowboarding instructor and Surfer. "Find a job you love and you won´t have to work for the rest of your life;)"
Interview with Andy Warhurst currently shaping longboards for Rake Surfboards. "Plumbers dont knock off, then go hang around drains and pipes. I'm truly blessed in that sense I think."